Making an omelet can be terrifying at first, but in this case, practice will make perfect, and so will the right tools. 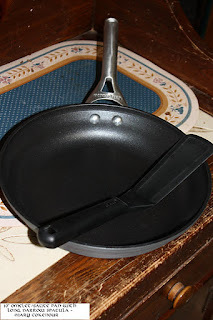 While a skillet will work in a pinch, an omelet/saute pan has sloped sides making it easier for the spatula to work with the egg mixture, and to slide the finished omelet out of the pan. Having a long, narrow spatula is a blessing as it slides more easily under the cooked egg mixture to help flip over one side and enclose the ingredients without breakage. 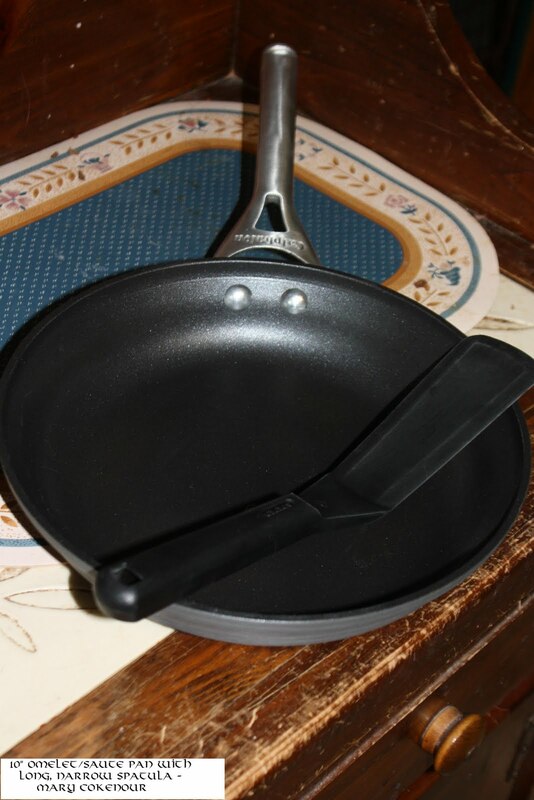 When purchasing your pan, look for a 10 inch heavy duty nonstick brand; remember that this will also work for sauteing, not just making omelets. You also don't want to go too large on the pan, as it will be more difficult to work with the egg mixture; more surface to fold will mean more chance of breakage. When it comes to seasonings and herbs, you have the choice of adding them to your egg mixture, or sprinkling them over the mixture once it's in the pan. Ingredients for inside the omelet can be just about anything you would enjoy with eggs; just make sure that meats and vegetables are at room temperature. Nothing worse than having a nice hot omelet loaded with cold ingredients in the center. Cheese should be thinly sliced or shredded to make sure it melts properly as the omelet cooks. To get started, melt the tablespoon of butter in the pan over medium-high heat. While doing this, whisk together in a small bowl the eggs, water and salt. The butter will foam when first melting, but once it stops pour the eggs into the pan evenly and let them settle in the pan for about a minute. Gently lift an edge, tilt the pan and allow a little egg mixture to flow underneath and repeat this all the way around. Continue this procedure, lifting a little more of the solid egg each time, until all the egg mixture has been incorporated around the pan. You are basically allowing the omelet to build up. On one half of the omelet, begin adding your fillings; cheese first, so it can melt; next meat and finish with vegetables. Only do this on one half as you'll be flipping the other side over the ingredients you added into the pan. Let the omelet sit for two minutes, now gently slide your spatula under the egg only side of the pan and quickly flip it over the filling side. Don't think about it, just do it; otherwise you are giving the omelet a chance to break where the spatula is not holding it. The above photo is of a Chili Cheese Omelet I made for my hubby. I had about 1 1/2 cups of my Sirloin Beef Chili left over and a cup of shredded Mexican mix cheese. Inside the omelet, I spread 3/4 cup of the cheese and then one cup of the chili over that. After flipping over the egg only side, I spread the remaining cheese and poured over the remaining half cup of chili. Not a bite was left on his plate. So be a little adventurous and make that omelet you're craving; it might be messy at first, but it'll still taste yummy.